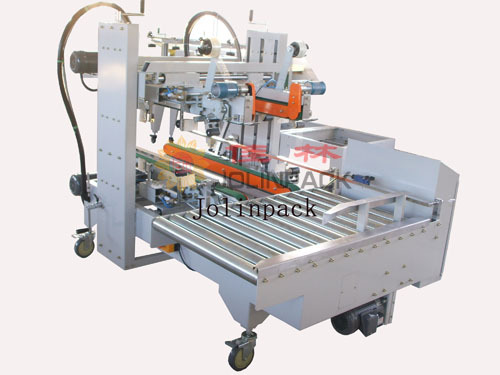 JTG-09L Semi automatic carton edge sealing machine L type(auto carton con sealer). 1.characterized with simple and easy operation, economy ,durable,safety and low rate of malfunction. 2.the width and height are adjusted manually for packing cartons of the same size at same time. 3.the carton will be turn 90° after the top and bottom sealing and pushed into the corner and side sealing system by the case pushing board. 4.the four sides and corners of carton are sealed at the same time quickly and smoothly with the advantages of beauty,high efficiency and manpower-saving.